We are now on our way along the Silver City Hwy taking us to Broken Hill in far west New South Wales. We had a couple of nights in Mildura and a chill out day. Got 4 corsets finished and one sent away to its new owner. Piping done and pinned for a “yellow” project and more bling and stars for the “teal” project. 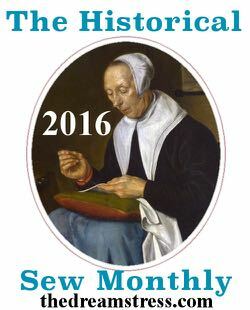 Now, if I just get my hands on an overlocker/serger this will also include completion of a pair of pants as well and will be into other projects! Never a dull moment, love it. 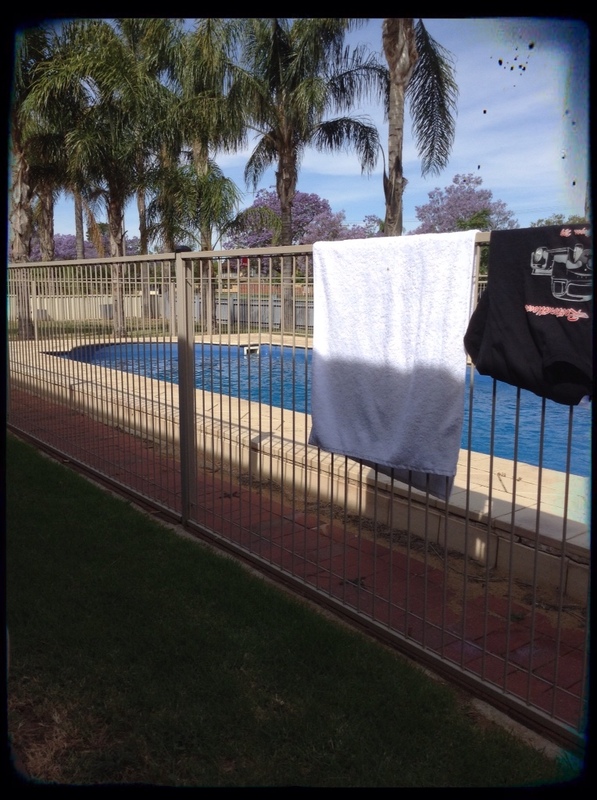 Yesterday afternoon we enjoyed a swim at the Motel, 36C/98F, although there hasn't really been enough hot days for the pool to warm up fully so took a little while to get used to the water, suffice to say it was very refreshing! Then on recommendation we found the Curry and Tandoor Indian restaurant. Chicken Tikka Masala, Lamb Rogan Josh, Naan Bread, Samosa's – perfect, hot, fabulous food. Beads of sweat on Jack's brow a good indication it was good! A leisurely start to the day, will take us around 3 hours to get to Broken Hill. Broken Hill is a mining town – still mining – in fact the BH in BHP Billiton is for Broken Hill (I learnt something new off Google today). It has been referred to as 'Oasis of the West', 'Capital of the Outback' but more commonly known as, and what I've always know it as, 'The Silver City'. Broken Hill was named by Charles Sturt (the explorer) in 1844 whilst discovering the Barrier Range. Silver ore was discovered there in 1883 by a boundary rider named Charles Rasp. It was/is mined for silver, lead and zinc. 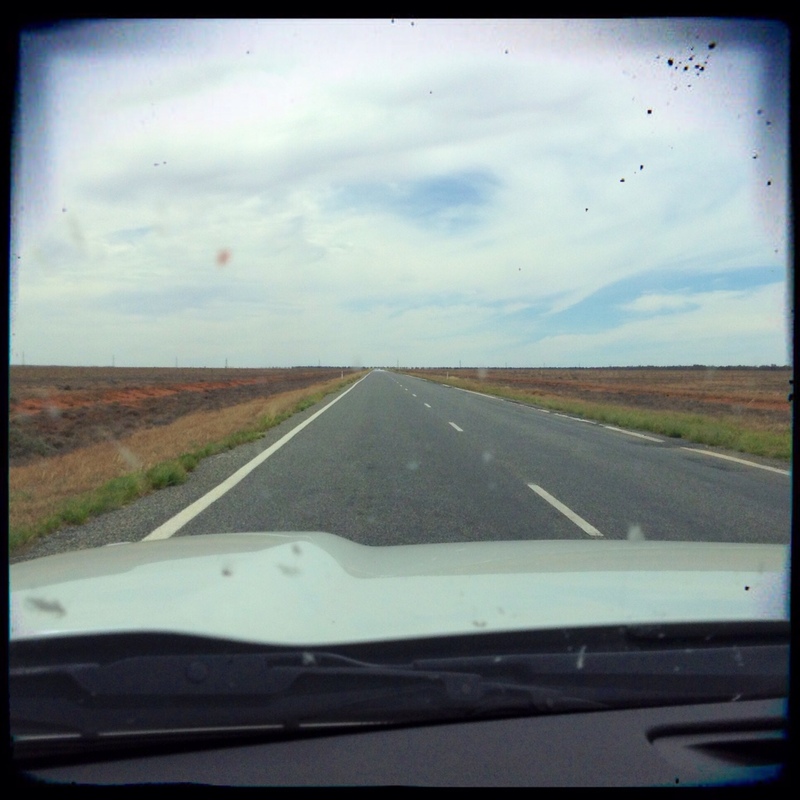 'We're on the road to nowhere……..' It's one of those long highways of nothingness travelling out here. We've past a heap of wild goats, the odd emu and the only kangaroos we've seen so far were roadkill. Made a quick pit stop at Coombah at a little servo (service station aka gas station) and met a couple from the UK who spend time visiting many countries but spend a good portion of their time in the US in Florida. Maybe we will see Susan and Martin somewhere again. So we are now in Broken Hill at our friends, Lusty Pearl and Slap Happy (aka Phil and Helen Grossi), they are Still Memories Digital Photography and cowboy pards. 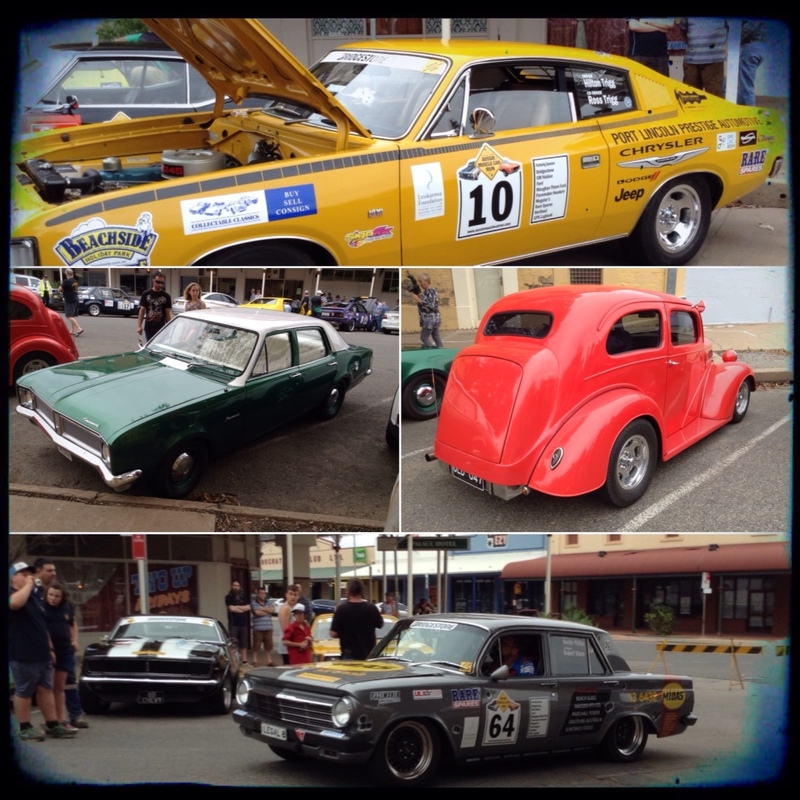 Tonight (Tuesday) We are down at the Palace taking pics of the Muscle Cars that are participating in the Aussie Muscle Car Run. 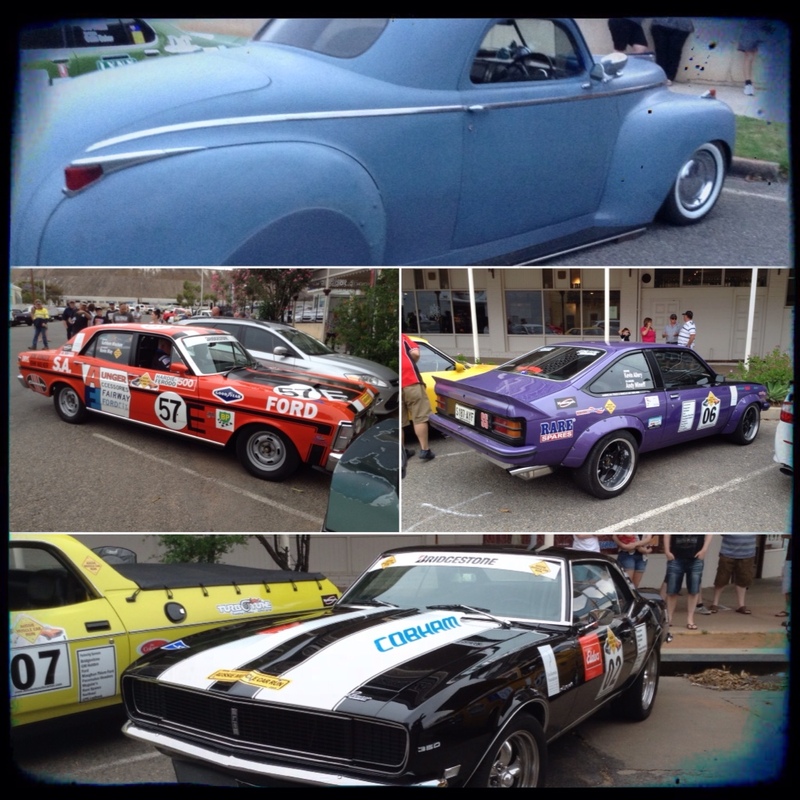 This is a charity run for Leukemia Foundation, 7 days, 2,218 kilometres. 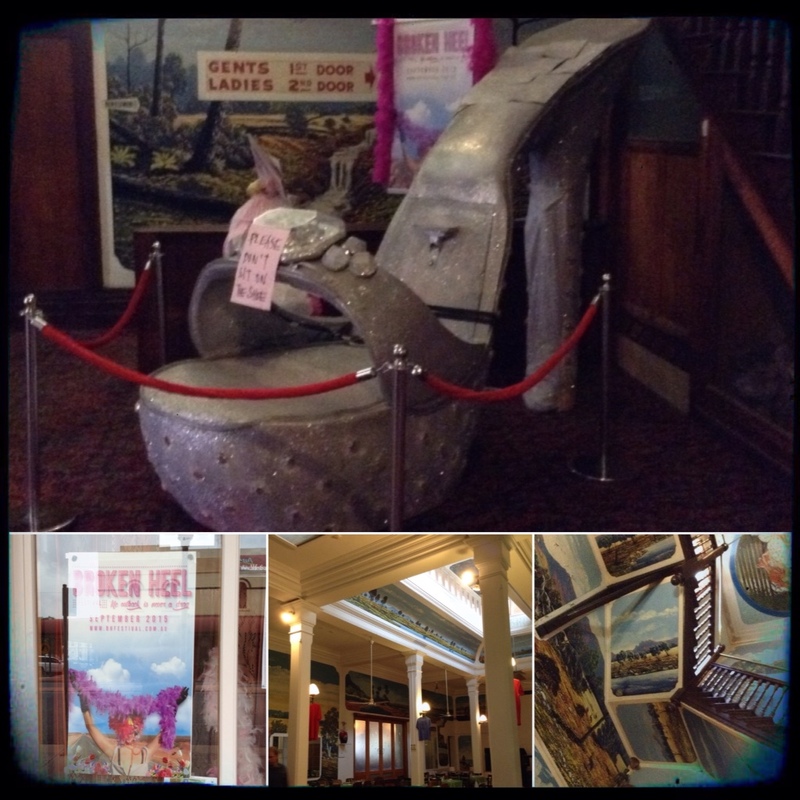 The Palace is famous for featuring some of the filming of Priscilla, Queen of the Desert both here in Broken Hill and some in the little town of Silverton on the outskirts of town. The Palace has also just had a tribute show to Priscilla called Broken Heel. The shoe sits in the foyer of this unusually Australian ornate painted hotel. Wednesday was spent chillaxing and applying more bling and cutting out of leather work for a costume whilst watching Boondock Saints. 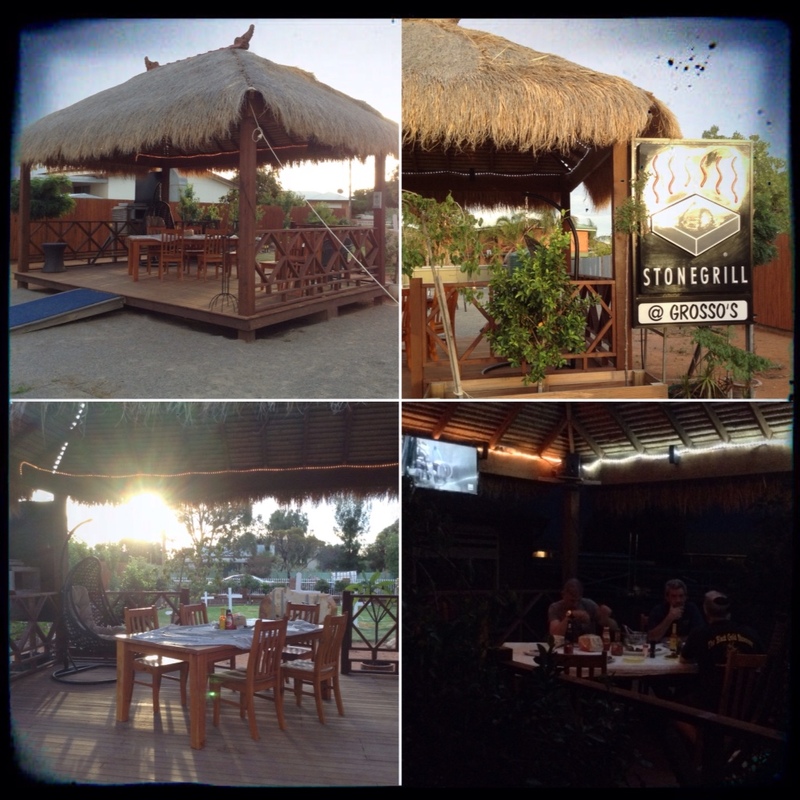 A BBQ s Ned off under the Bali hut at Stonegrill@Grosso's. Love it. Thanks for having us guys, was great to catch up with you again! 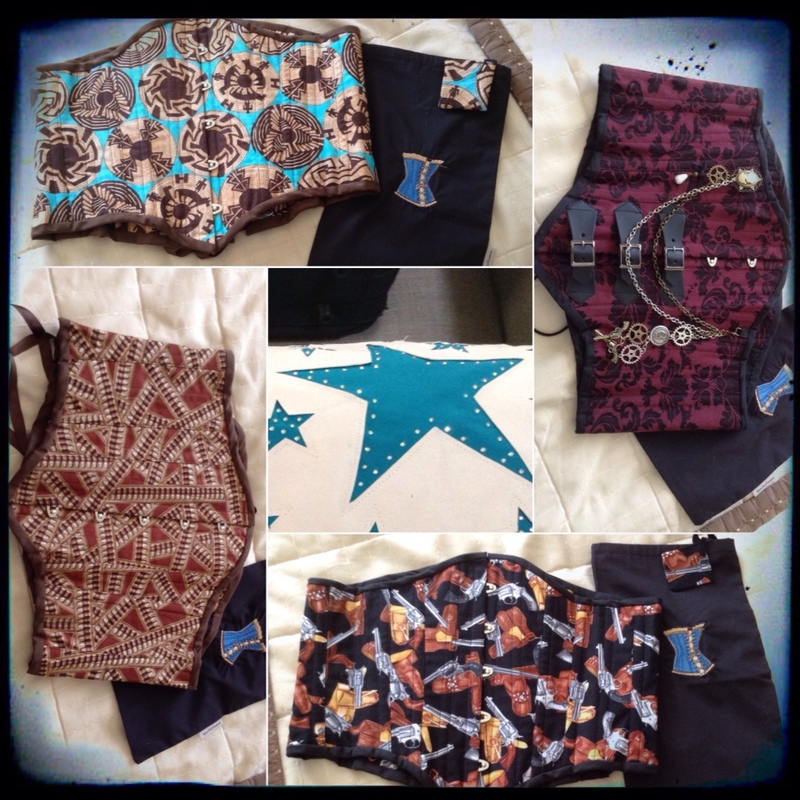 This entry was posted in Love My Life and tagged Australia, cowboy action shooting, friends. Bookmark the permalink. Woo hoo! Yellow project. Got to be me! Love your travel channel, BTW. Awesome! Surely is! Embroidery threads have turned up in bulk, Mums machine not working properly though so may have to wait to do embroidery when back. Everything else is together pretty much. Will send you pics soon!